We report a 55-year-old man with a renal allograft that developed sarcoidosis. His autosomal dominant polycystic kidney disease (ADPKD) progressed to end-stage stage renal disease when he was 52 years old, and he underwent living-donor kidney transplantation at the age of 53 years. 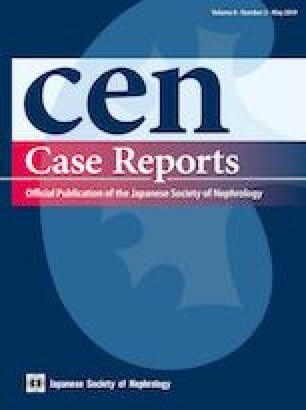 His proteinuria worsened at 19 months post-transplantation, and his renal function began to decline at 29 months post-transplantation. A renal allograft biopsy performed at 31 months post-transplantation revealed non-caseating granulomatous interstitial nephritis. The patient was treated with prednisolone (0.5 mg/kg/day), with gradual reduction in the dose. His proteinuria improved and renal function did not deteriorate any further. To the best of our knowledge, this is the first case of sarcoidosis in a renal allograft recipient whose primary renal disease was ADPKD.